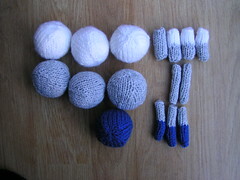 A knit version of the acrylonitrile molecule, as used in the production of acrylic fibres, represented as a ball and stick model. This pattern is also available as a free PDF download, provided by ravelry. NB: This pattern requires the knitter to crochet a chain to start each sphere. You will need seven of these to make your molecule: 3 in white (hydrogen), 3 in light grey (carbon), and 3 in blue (nitrogen). 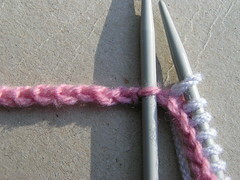 Using scrap yarn, crochet a chain of 34 stitches. Knot the end. 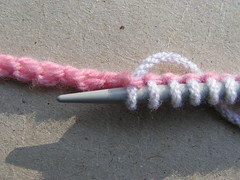 Turn the chain over, and find the ‘bumps’ running down the centre of the chain – using DPNs, knit a stitch into each bump, until you have 32 stitches on your needles. Join to work in the round. Row 2 : (k6, k2tog) to end (28 sts). Row 4 : (k5, k2tog) to end (24 sts). Row 6 : (k4, k2tog) to end (20 sts). Row 8 : (k3, k2tog) to end (16 sts). Row 9 : (k2, k2tog) to end (12 sts). Row 10: (k1, k2tog) to end (8 sts). 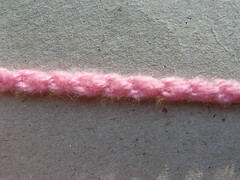 Cut yarn leaving longish tail; run through these 8 sts and pull closed. 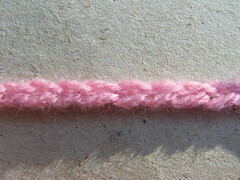 Undo knot in end of scrap yarn crochet chain, and begin to ‘unzip’, placing live stitches onto DPNs (32 sts in total). Work rows 1-10; stuff ball with waste yarn or stuffing and close as before. Using a needle, run both ends through into the ball to hide ends. These come in three varieties – single, double and triple. Leave a tail of around 10cm when casting on and off, to use when stuffing later. You will need four of these – one in light grey, and three in light grey/white. Cast on 9 stitches. Work I-cord for first couple of rows, then switch to DPNs. Knit 14 rounds in total; cast off. Cast on 9 stitches with light grey yarn. Work I-cord for first couple of rows, then switch to DPNs. Knit 7 rounds in total; break yarn. Join white yarn and knit further 7 rounds; cast off. You will need two of these in light grey. Cast on 6 stitches and work I-cord for 14 rows. You will need three of these in light grey/royal blue. Cast on 6 stitches with light grey yarn. Work I-cord for 7 rows; break yarn. Join royal blue yarn and knit further 7 rounds; cast off. Stuff sticks firmly, using ends of yarn and waste yarn in the same colours. Sew together as shown in top photo. It’s been a while since I went anywhere near a laboratory, so the positioning of the bonds is likely not 100% accurate, but all the atoms are in the right place – I didn’t want my molecule to be entirely flat, so I used a little artistic licence, but so long as you check that the balls are in the right place relative to one another, and you don’t have more than 4 bonds for each grey (carbon) ball, 3 for the blue (nitrogen) and 1 for the white (hydrogen), I reckon you’re laughing. You could stuff jingly bells into the balls – I’ve also been thinking that pipe-cleaners inside the sticks might be an idea for bendy fun, if you aren’t going to let it anywhere near babies and/or small children… and toying with the idea of making various colours of ball, not stitching them together, and using velcro patches in the appropriate places. Oh, and for maximum ha! value, it should be knitted using 100% wool. Fantastic! Thank you!! I’ve been looking for interesting things to make and give my science-teacher daughter to use in her classroom. This fits the bill perfectly. 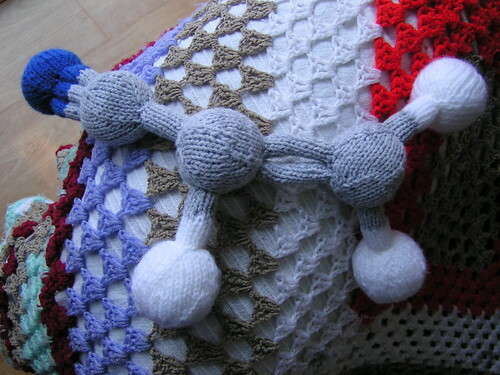 at the last picture there is something underneath the molecule what stitch is that in? Hi, that’s one of my late mother’s crocheted blankets – it’s just like a huge granny square, really. I can’t really describe the stitch any clearer than that as I know next to nothing about crochet at the moment – all I know is how to make those big squares, in fact – though one day I hope to learn more. I’ve got no crochet vocabulary whatsoever. This is just fab! I’m a science teacher (biology & chemistry) and just love the molecule. Now I can combine my work & my hobbies! This is fantastic. 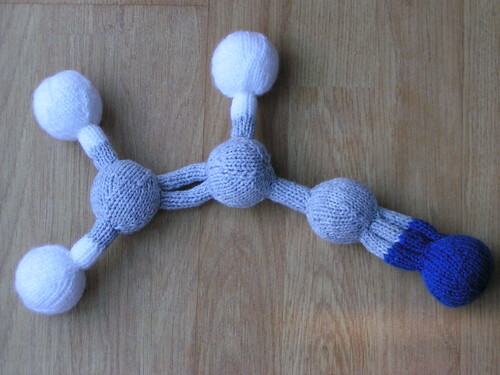 I’ve been having fun making chemistry knitting charts, but I never imagined attempting to make a molecule in 3D! Thank you for the inspiriation! And ONE in blue for Nitrogen, not three. 🙂 Awesome. The C-triple-bond-N is the nitrile, I guess. I love this! The only improvement I can envision is making the bonds different lengths because a single bond is supposed to be longer than a double bond, and a double bond is supposed to be longer than a triple bond.